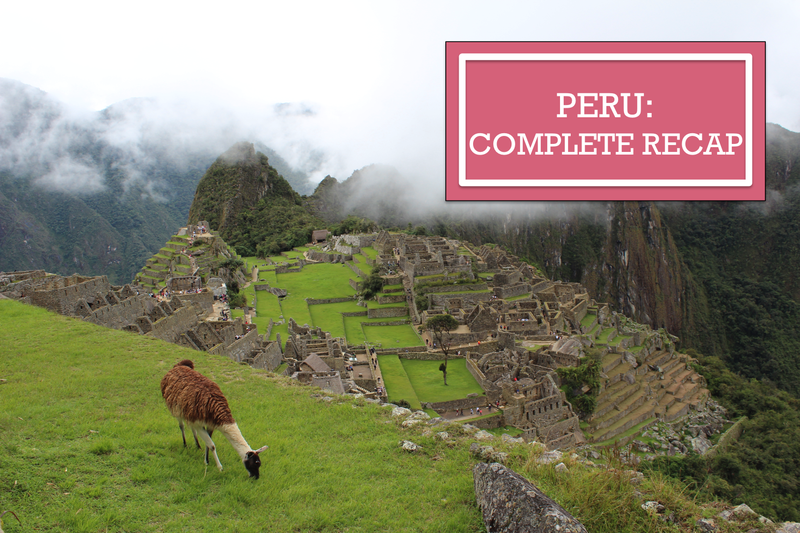 This is the final post for our Peru trip, with a list of all the posts and a bit of the odds and ends gathered from our total experience. I've really enjoyed sharing this trip in detail with all of you; I am using the same narrative written to create our printed photo album of the experience. Please let me know anytime if you ever have any questions! Passport: You'll need your passport, as well as the little paper from immigration, to check in at all of your hotels as well as for entrance into Machu Picchu. Don't lose the paper; tuck it into your passport and remember when you'll need it. Altitude & Sun: Bring Ibuprofen to help in case you have altitude sickness. Even better, adjust your itinerary so you spend time in the Sacred Valley vs. Cusco in the beginning of your trip, as Cusco is higher up than Machu Picchu and the valley. We also drank the coca tea which at least had a positive placebo effect; we did not experience altitude sickness, just shortness of breath while hiking/climbing steep steps. In addition, even on cloudy days the sun exposure is strong. Safety/Language: I felt safer in Peru than I have in many other countries. I took precautions, such as wearing my bag/camera in the front in crowded places, and we made sure our passports were secure. I felt like people were less aggressive; even when they're making a hard sell, an insistent "No, gracias" is usually met with a kind, "Okay, maybe tomorrow!" In addition, most people in the very touristy areas speak a decent amount of English; that said, why not try your Spanish? Motion Sickness: I found that a Dramamine on the days we were on the road (think curvy, switchback elevations), in a train, or flying in/out of Cusco (elevation, so the take-off and landing is kind of steep) helped me. I do tend to get motion sickness, and the bus ride up and down to Machu Picchu was a challenge when I forgot the medicine. I'm sure the altitude doesn't help. Toilet Paper: Even at high-end restaurants and hotels, you may notice a trash can in your bathroom stall and signs that ask you to throw your used toilet paper into the can. The plumbing/pipes in the country are inconsistent, so flushing your TP might cause an unpleasant blockage. It's a weird habit to break during the trip, so just forewarning you! Showers: Don't always expect H&C to designate Hot and Cold. Remember C = Caliente = Hot, and F = Frio = Cold. I got into a cold shower because the "F" knob I assumed to be hot like fire or fuego... LOL! Cash: Touristy locations like some places in Cusco, as well as the Lima airport, accept U.S. dollars. I used an ATM to get Soles (the local currency) vs. the Money Exchange places because I think the exchange rate is better, and my bank reimburses ATM fees. At the time we visited $1 = about 3 Soles. Taxis: We didn't take any taxis, but just know that some of them are authorized and some are not... and it's hard to tell between the two. If you do take a cab, remember they don't use meters, so you negotiate upfront what the cost is going to be. Shopping: We didn't buy anything really high-end, but we love the souvenirs we took home. You can get hats, scarves, sweaters, socks, and bags in vibrant colors and patterns. We also took home some pisco liquor via Duty Free on the way home, for a great price. I loved feeling how soft the items were and choosing from the assortment in markets. Sure, the cheaper stuff is probably made in China, but the alpaca is sourced in Cusco and you can't beat the prices after a little negotiation. We were paying around $5 for a hat or scarf, a bit more for a blanket, and we got a duffle to bring it all home for under $20. That said, you can also by pure alpaca, baby alpaca, fair trade alpaca, or vicuña, and pay in the hundreds of dollars. We just needed to bring home small items to remember the trip and gift to friends and family. Do you think you'd like to visit Peru?